As James Brown sang "This is a man's world, but it wouldn't be nothing, nothing without a woman or a girl." the song rings true. There are two things that make the world go around. Music and the beauty of a woman. From birth to death we are hypnotized and passionately intrigued by both. 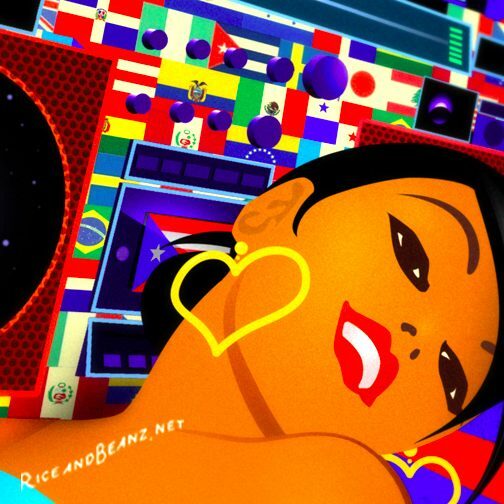 The "Two Things" limited edition print is now available for purchase at the Riceandbeanz store. 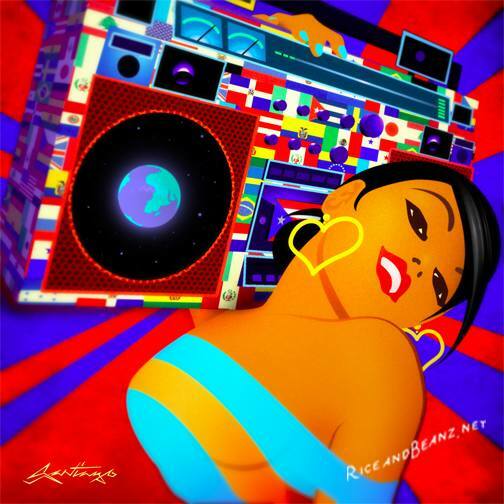 She's an international urban bombshell sporting a boombox covered with flags of the world. The print is full color 13 x 13 archival exhibition quality on acid free paper mounted on 16 x 20 board. Includes a numbered Certificate of Authenticity. ready to ship. Artwork shipped in protective plastic seal inside stay flat mailer. Limited to only 50 prints.